In this episode we review the vintage Starsky & Hutch board game and Monica surprises Jen and Rachel with art made by Paul Michael Glaser. Also, more recommendations of our favorite fic, a discussion of Magnum Force fandom, and the discovery of a S&H reggae song. FYI about the embroidered workshirt, when I was in jr. high, (1975-76) embroidered workshirts were all the rage. They were not considered thrift shop material. I tried looking for pictures online, and was surprised how little of it was represented in the way they looked back then. Maybe it was a California thing, but plain workshirt (Starsky) and embroidered (Hutch) were very, very in and commonly seen worn around my jr. high campus, though Hutch’s guitar on the back was rather unique. Usually people had many smaller embroidered art around the shirt. No shirt was alike. Thanks for the historical fashion note; I read this comment out loud to Rachel and Jen and none of us had known about this trend! Somehow the idea that Hutch bought his guitar shirt at an actual clothing shop — not a thrift store — makes it even better. Do you mind if we read this comment in the next episode to expand on the 70’s fashion discussion? No problem. I’m pretty sure many even did their own embroidery. I didn’t have one, but my friends did. And I certainly followed other 70s trends! I have a group on Facebook called Rewind. It’s not fanfic oriented, but I share a lot of my photo collection, so photo retouches, and post willy nilly about what I currently find online. I know a lot about locations, which are deep into my Facebook feed, and not always easy to get to. You’re all welcome to join. Thank you, I probably will join; I do love seeing photos of PMG and DS. Oh, and Hutch wore another embroidered shirt at the end of “Gillian”…. EVERY S/H fan should give The Sentinel a try. It’s a total next step in the slashy partnership codependant buddy cop show. Harry/Johnny was never a major ship in the league of K/S, S/H and MUNCLE. It was a big thing in S/H fandom because it featured a David Soul character. There are crossovers with S/H, and Harry and Johnny make a cameo in Murder on San Carmelitas, a famous slash novel with the undercover as gay trope (avant la lettre). The fans liked it, but it was only written by a few fans and passed around instead of published in zines. Vas and Dex was another such fandom that was passed around by knowing the writers and sending them money periodically to get the next stories. Vas and Dex is a SH AU with a small amount of slash stories included in the gen timeline. Feel free to talk to me about fandom history and these rarer ships. The fans who flutter from one hype fandom to another were called ‘fandom butterflies’. Most fans in current day fandom are fandom butterflies. They’ll get excited about what’s new, what’s current, what’s just out or anticipated to come out. The true test of a fandom is how long it lasts after the show is off the air or when they’ve stopped making the movies. It’s been anywhere from immediate death (Beauty and the Beast fandom of the 80s) to a decade before declining. The longer the fandom burns after the original is out of production, the more chance it has of remaining forever. I got into S/H fandom in the late 80s and people were selling off their collections because – and I quote – “the fandom is over”. But S/H fandom never died. It kept coming back and bringing in new fans. It’s burned a delightful slow burn ever since and next to K/S fandom is one of the greats our there. ‘Sugar’ had a supporting role in the movie Torch Song Trilogy. This is an extraordinary movie and play by Harvey Fierstein, which I recommend highly if you’re interested in gay cinema. important to note that the play/ movie was set and written before the advent of AIDS, so the behaviours in the gay ‘scene’ is more indicative of the world Starsky and Hutch would’ve been in in Death in a Different Place as well as the slash sorties set before 1982. I run the facebook group The Original Bromance Ship Slash. I’m in the camp of sexual tension between Starsky and Huggy. I also feel the scene in A Body Worth Guarding implies there’s a longer history between Starsky and Huggy. 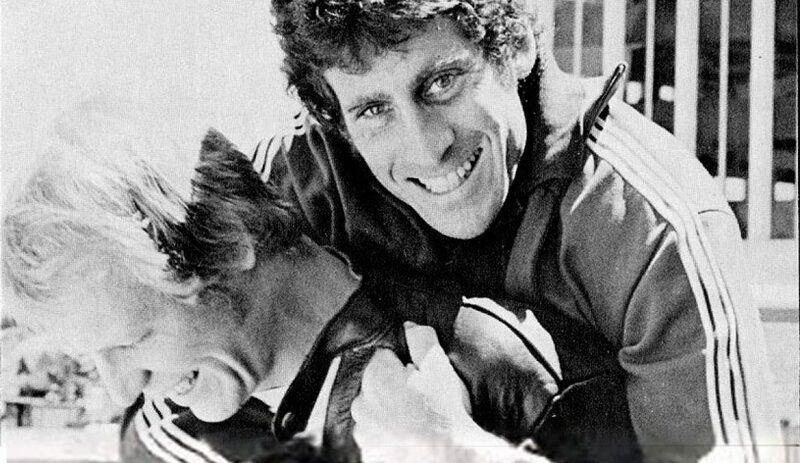 That Huggy was Starsky’s connection originally and they let Hutch in when he partnered up or during their academy days. That’s my head canon. Huggy also shows a keen knowledge of trivia (ha ha) where Sugar’s home address is concerned in a Different Place. When asked, he says “Does a fly know fly paper?” which is as good as admitting Huggy is in the gay scene in town, one way or another. Thank you so much for all your real-time reactions to our podcast. We did reply on SoundCloud but I’m not sure if that’s still viewable (it should be, but who knows?). I also copy-pasted the replies onto the wonderful FaceBook group; I hope you saw either that or our replies on SoundCloud. I’ve not been able to retrieve any comments in SoundCloud, nor even my own. So either I’m doing something wrong or it’s not working on my phone. I did see the comments on the facebook group. I’m pretty sure I responded to them. If not, give me a prod. I’m happy to have the group grow steadily over the past two years. With almost 250 dedicated members from all age groups, it’s clear this fandom is still alive. We may be small, but will never go away. Your podcast proves that too. And there are a handful much larger facebook groups out there that are filled with fans of the show without the shipping aspect. They have 1000+ people on average. Some of whom are also making fanworks (gen). So this fandom is here to stay. I’m so happy you’re doing the podcast! Hey, thank you so much for listening and for commenting! Like you, I’ve been having some internet difficulties — I don’t seem to be getting e-mail notifications for comments here. So sorry for the late reply! It is incredibly heartwarming to see this fandom still active. Back when I was most active on LiveJournal, about ten years ago, I saw there was a small but active S&H fandom there. Then when I fell back into the S&H fandom just last year, I was worried that the decline of LJ had taken S&H with it, because there was barely any fannish activity on Tumblr. When I found the Facebook group it was like suddenly the curtain had been pulled away, and I saw that the fandom was VERY alive! I appreciate that the original fans have kept a welcoming place active so that newbies like me can read, discuss, and create in good company too. And thank you so much for listening to the podcast. Although Jen, Rachel and I would be happy just making this for ourselves and for posterity, it’s so nice to know that other people are listening! I feel so great about your experience of finding the slash facebook group. That’s what I set out to accomplish 2 years ago. Thank you so much for articulating! 3 years ago, S/H fandom was stuck on LiveJournal and mailing lists. But even far before the Russian takeover of LJ, fandom on LJ was on the decline. No new fans are using the platform. So once people trickle off, the groups will die. The same with mailing lists, which have had no new influx for a decade now. The old fans don’t leave, but that doesn’t facilitate new fans finding the fandom. And the old fans are happy where they are. I found slash fandom much more vibrant on Facebook and Tumblr. Even on Twitter, unbridled slash fandom. Shipping galore. I felt we were missing out and fandom was missing out on us. I wanted to put S/H in the thick of shipping fandom, where it belongs. How can people find us if were hiding? No one else is hiding ships anymore, so why should we? We have to get with the times! So I chose a forum that had private groups, which helps the older fans, and a huge world wide audience, to make our ourselves known, so people could see us. I got 30 fans overnight. 60 fans signed up in the first 24 hours after opening up the group. I did get backlash from fearful fans on the old forums: the mailing lists and LiveJournal. They said it was too dangerous and the didn’t know how facebook worked. They were fearful their protected space would be viewable by friends and relatives. They admitted to not knowing anything about social media. Could they participate in the modern world online? I heard mostly fear and a lack of knowledge and experience. I decided that they had a right to their feelings. I would forge ahead with a group open to old fans, but inviting me fans. We’d be visible to the world, and talk in private, so the world can see we’re here and we want to share the love. In one year we had 150 members. In two, 250. All members have had to answer questions to let me know they’re truly interested in S/H, which means about one in three applicants to the group actually are let in. The others misread or didn’t read or just plain hit the wrong button. So the 250 are real fans of S/H, which is what has made the group so vibrant, safe and fun. Now, consider how old and small this fandom is. We don’t have the Star Trek mega franchise to support us like K/S fandom does. We aren’t hot like Supernatural, Sherlock or Game of Thrones are. We aren’t teen oriented, like Teen Wolf and One Direction. We’re just what Starsky and Hutch always have been. A buddy cop show from the seventies about two men who love each other. Episode 19: Sharecon (part 2): The People of SHarecon!